A spinal cord injury can have long-lasting if not permanent repercussions on a person’s life. The procedures to fix such injuries may be painful or extensive, and in some cases they are very expensive. At Paulson & Nace, PLLC, we understand what it means to you and your family that you have every opportunity to heal and recover. That is why our family fights so hard for spinal cord injury victims in Washington, D.C.. Our team of skilled personal injury attorneys wants to help you obtain the compensation you need to begin the recovery process. If you have suffered a spinal injury, let our family help you protect your family and your future. Your spinal cord and brain make up your central nervous system. Together, they allow your body to move and work as it does. A serious spinal cord injury can not only affect your mobility, but some research is showing that when left untreated it could lead to brain damage as well. A slipped disc or cracked vertebra may require surgery to correct, and the treatments can be painful. Spinal injuries can also lead to paraplegia, paralysis of the lower half of the body, or quadriplegia, paralysis from the neck down. Paralysis could leave the victim wheelchair bound, putting him or her at risk for pressure sores and blood clots. Sometimes the paralysis is instantaneous, when the spinal cord is severed. In other instances, the paralysis could come on gradually as the area around the injury swells. Depending on the cause and severity of the injury, the paralysis could be permanent, and some quadriplegia patients may require breathing or feeding tubes in order to live. We know the devastating effects of a spinal cord injury, and we know what types of medical treatments a victim may need to survive. We are unafraid to take these serious cases to trial to ensure that your family obtains what they need. We do not accept low offers from insurance companies whose primary goals are to make a profit, because we know that there is no “fair” price for your ability to walk. A spinal cord injury victim may be entitled to compensation for medical bills, lost wages, potential earning capacity and pain and suffering – compensation you will need to provide for your family for the duration of your life. 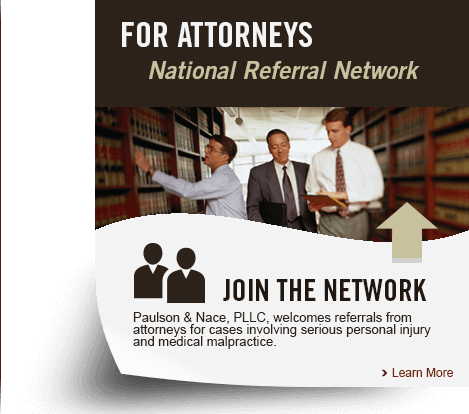 Paulson & Nace, PLLC, protects the rights of spinal cord injury victims throughout Washington, D.C.. If you were injured because of someone else’s negligence, we want to hear your story. Please call us at 202-930-0292 or fill out our contact form to schedule a no-obligation consultation with one of our experienced trial attorneys.